Microprocessors are small programmable chips you can buy from your local electronics store for about $2. Shown left is a typical programmable chip used in roulette computers. You need only basic knowledge of programming to construct a simple roulette computer program to be installed on a chip. Don't let the talk of microchips intimidate you if you are new to it. The chip is basically like your home computer, and the software is whatever runs on it. Literally some roulette computers are nothing more than a few lines of programming code, and we'll explain this in other sections. Once you have written the actual roulette computer software, you need to install it on the microchip. This requires special hardware called a "pic programmer" that you connect to your home PC, and they usually cost around $50. The pic programmer I use is shown left. There are cheaper copies of it that work just as well, but can be prone to instability issues on some computer systems. Next you will need to put your chip on a circuit board, and for this you will need someone to design it for you. Professionally printed circuit boards cost very little, even if you hire an electronics technician to assist you with design. But if you are new to electronics, you will realistically need someone to construct all parts for you, including the battery, the connectors for the rotor and ball clocking cable etc. It takes the average electronics technician about 30 mins to assemble a basic roulette computer using a programmable microchip. The main advantage of microchip roulette computers is they process timings and data very quickly. This makes them ideal for any applications involving timings. But the disadvantage is they can store only very little information, which makes them only feasible for simplistic roulette computers that nowhere near take advantage of all physics to achieve accurate predictions. 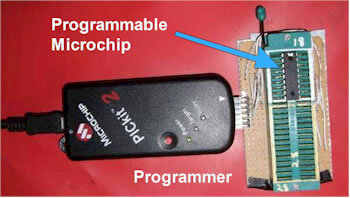 To give you an idea, a typical microchip used in roulette computers stores only about 1.2kb of programs. This is tiny. It is about the same size as 5 x 5 pixel image. Although more powerful chips are available, by the time you construct a computer that uses them, you would have spent over $50,000 just on development, with each unit costing you about $10,000. Ultimately this is what you'd need to pay to construct a roulette computer from scratch with microchips that are capable of utilizing all physics of roulette wheels. While this would be the ideal situation because of the processing speed of microprocessors, we found an overall much better alternative, without sacrificing accuracy. We have created programmable chip computers no bigger than a coin, although we preferred accuracy over small size. We called it the "coin" because it was about the same size. It was operated by the player's teeth to take rotor and ball timings, and was designed to be a "swallowable" device in case the user was caught where it was illegal. To let the player know where to bet the device provided a slight sensation in the user's cheek when the predicted number was at a reference diamond on the wheel. While it could be adapted to be finger-operated, we ultimately found the hardware had too many limitations. Another of our microchip roulette computers used voice audio to announce predicted numbers. Previously, every other microprocessor roulette computer used either vibrations or high voltage zaps. Originally this device was intended to be only a test device to determine if there was any difference in the accuracy of predictions between microprocessor and our other devices. To determine accuracy of timings between hardware, we connected numerous devices to the same button, then clicked the button repeatedly to see the variation in registered timings. Despite the simplicity of the test, it proved effective and conclusive. Ultimately we found some hardware was incapable of processing accurate enough timings for a roulette computer. And without accurate timings, a roulette computer cannot accurately predict. Nevertheless, we were able to settle on the ideal hardware. Because mobile phones are very common and easily explained by players (if they are caught), we focused our development on them. But a big problem is that by default they use "java timers" which is basically software that is easily interrupted by other processes on the phone. You'd be familiar with how your PC lags from time to time. The same thing happens with java timers on mobile phones. In other words, timings from unmodified mobile phones can produce substantial errors in timings. Some phones using java timers were as inaccurate as 500ms (mainly smart phones). Our testing determined that the average mobile phone was capable of producing timings accurate to within 15ms without any modification. This is 0.015 seconds. For a basic roulette computer algorithm, this is easily accurate enough. Sellers of microprocessor roulette computers claim it isn't because they want you to believe exclusively their hardware and product is the best. The reality is a basic roulette computer algorithm determines only rotor position for a fixed and assumed ball drop time. A visual ballistic player will usually be accurate to within 1 ball revolution, which is the same as any basic roulette computer regardless of the hardware. This is a discrepancy of over 2000ms (2 seconds). Even if a visual ballistics player is highly skilled, they will still be inaccurate by about 100ms or more. Overall, an average visual ballistics player will achieve almost exactly the same accuracy in their predictions as a basic roulette computer, whether the computer is accurate to 0.0001ms, 15ms, or even 50ms. This is simple fact, although sellers of microprocessor devices will try to convince you otherwise with diversionary technical jargon. Another consideration is typically when a roulette computer player clicks the button to take rotor and ball revolution timings, there is about 50ms of error. After all, you can't expect to click the button perfectly. So with mobile phones, in the worst case scenario with the average phone, your timing errors will be 30% less accurate. However, because basic roulette computer algorithms target specific revolutions, the error margin for timings can be enormous and it will make almost no difference to accuracy. To be precise, the difference is about a 3% decrease in accuracy between microprocessor and the average UNMODIFIED mobile phone roulette computers, assuming they both use the basic algorithm. The only instance a microprocessor will have significantly more accurate timings over the average unmodified mobile phone is if the roulette computer's algorithms require precise timings to predict something like which diamond the ball is most likely to hit. iii. installing a crystal oscillator that feeds microprocessor timings to the hardware, and routes the data to the roulette computer software. The modifications ultimately enable the phones to process timings accurate to within 1ms, which is more than what is needed for precision calculations. To determine the level of accuracy, we simply connected up two phones and a microprocessor stopwatch to the same switch. Each time the switch was pressed, timings were registered on all three devices. The deviation is never greater than 1ms.